Elizabeth Ruth (Shortridge) Hatton! 9-30-1932 to 12-12-2018 Born Bette Shortridge, Liz grew up in Quincy, MA and Acton, IN with parents Ward and Tizzie (Bustin), older brother John, and younger sister Dotte. Descended from a family of legal and education reformers, Elizabeth unknowingly followed in their footsteps with her lifelong commitment to human rights. As a child she helped her father grow things (pulling up seedlings to get the garden tidy), carry coal, and milk the cow. She sewed her ﬁrst outﬁt, doll clothes, at age 6. At 7, she cultivated three cotton seeds given out at her one-room school, but was too shy to show her crop to the teacher. She raised pet goats until they got in trouble bashing in a neighbor’s door. She played ﬁrst base, wrote editorials, reﬁnished furniture, attended peace marches, took up tap dancing in her 50s, and could sing in harmony and sign her name with both hands in mirror images simultaneously. Against her father’s wishes (brother John helping with the getaway), Elizabeth put herself through college as a cafeteria worker. A book called “The Family Nobody Wanted”, about missionaries with 17 children, most adopted from around the world, made a deep impression. She worked summers at the Indiana Soldiers and Sailors Orphans/Children’s Home and later adopted three sons and fostered several others. At Indiana University, William Earl swept Elizabeth off her feet with chemistry formulas on their ﬁrst date, impressed her elderly father with his Harley, and they married after her graduation. Luckily an early adherent of natural childbirth, Elizabeth’s second daughter arrived in 20 minutes ﬂat in their VW beetle (in a snowstorm on New Year’s Day). Liz sewed all the clothing her two daughters wore through grade school. She and William adopted two sons and she returned to school (Wayne State) for a Master’s. She worked 23 years for Detroit Public Schools as a middle school art teacher and guidance counselor. 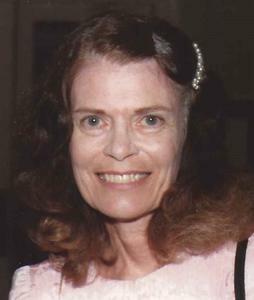 She involved students in exhibiting at the State Fair and shared her love of crafts, life drawing (bittersweet every Fall), and line dancing with them, often on her own time. Elizabeth instilled in all her children a strong work ethic and generously supported any educational pursuit. She laughed more with her sister Dotte than anyone else. As kids left home, Liz took on a summer job as “the ﬂower lady” for the City of Farmington Hills, working dawn to dusk. She created beautiful gardens at home in Farmington Village and at City Hall, courts, ﬁre stations, medians, and berms wherever she could ﬁnd space. She was ahead of her time, determined to contribute her way, stayed loyal to her vision even when it went against the grain (as it often did), craved justice, and sympathized with the maligned and powerless all her life. After retirement, Liz and William fostered sons Brian Phipps, Johnny, Arturos, Guy and Clark, and adopted Daryll. Liz and William moved to Hawthorn Cottage assisted living in March, 2010. To Lydia’s horror, without asking ﬁrst, Liz started ripping up the lawn as soon as the ground thawed to get it ready for the gardens she was planning. Together with fellow Hawthorn resident Nancy Wolpert they soon had created a “Friendly Garden Club” award winning garden on the lovely lawn of the Grand Traverse Pavilions. We are so grateful that Hawthorn and the Pavilions supported her passion by purchasing all of the ﬂowers she requested, even helping her with planting when she was no longer able to keep up. For 6 years Hawthorn enabled her to continue contributing to the community, which meant everything to her. The move to Willow Cottage was difﬁcult, but she soon adjusted because the loving staff tapped into her eccentricities and made the last 3 years as comfortable as possible. The family is forever grateful to the wonderful Pavilions staff for their support, patience, and care. Elizabeth was preceded in death by her husband William, son Andrew (Sherri), and brother, John Shortridge. She is survived by children Rebecca, Lydia, Nathan, and Daryll Hatton, her dear sister Dotte Radeke (Bob), grandchildren Mathew and Joe Fordon, Thea Torek (Valera), Kolin, Kelsey, and Julia Hatton, and Lizzie Hatton, sistersin-law Mary Helen and Linda Shortridge and Martha Burris, and 8 nieces and nephews. Because of her early activism in the peace movement and passion for higher education, memorial donations may be directed to the Veterans For Peace Chapter 50 Scholarship fund, PO Box 1421 Traverse City, MI 49685. Please visit www.lifestorytc.com to sign the guestbook and share your thoughts and memories with the family.